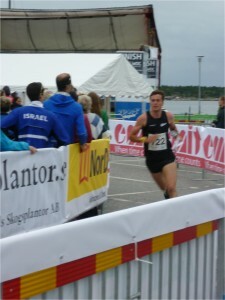 Tim Robertson, although disappointed that the course was perhaps not more technical, produced the best WOC finish ever by a New Zealand man when he finished 13th in the sprint final in Stromstad on Saturday afternoon, surpassing Chris Forne’s 17th place in the long distance in Hungary in 2009. With a start time in the middle of the field, at the arena run-through and map-flip 5 minutes into the course Tim was in 4th place, but, of course, with the fastest qualifiers still to come. 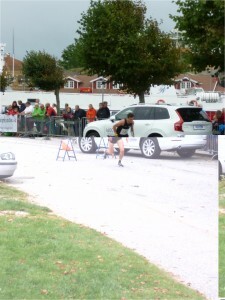 He improved this to actually be in 2nd place when he crossed the line, but gradually slipped out of the top 10 as the strong Swedish and Swiss runners in particular finished. In the women’s final Laura Robertson took a highly respectable 29th place, up from 40th place in Scotland last year, and Imogene Scott came in 38th. Both of these results earned valuable points for NZL as the top 13 nations over the sprint, sprint relay and middle distance events get places at next year’s World Games in Poland. The men’s gold medal went to Sweden’s Jerker Lysell, less than 3 seconds ahead of Matthias Kyburz of Switzerland. In fact there were 4 Swedes and 3 Swiss in the top 10, with the best performance from outside these two countries coming from Britain’s Kristian Jones in 4th place. Denmark’s Maja Alm convincingly defended her sprint title from Scotland with a 25 second margin over 2014 sprint champion Judith Wyder of Switzerland. 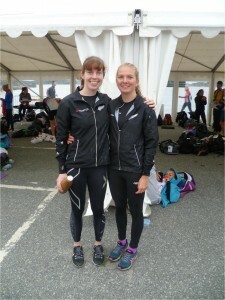 Australia’s Natasha Key, fresh from winning the W45 sprint at WMOC in Estonia, produced an excellent run to finish 19th. Women: 1.Maja Alm (DEN) 14:27.9, 2. Judith Wyder (SUI) 14:53.6, 3. Anastasia Denisova (BLR) 15:10.6, 4. Galina Vinogradova (RUS) 15:41.2, 5. Rahel Friederich (SUI) 15:53.0, 6. Elena Roos (SUI) 15:54.1, 29. Laura Robertson (NZL) 17:30.3, 38. Imogene Scott (NZL) 18:40.2.